Fito Segrera is the very first artist to complete Chronus Art Center’s research and creation fellowship. Since then he’s transitioned to Head of Research and Creation at CAC Lab (applications open until June 12, 2016). China Residencies: What is CAC? Who started it and what does it do? 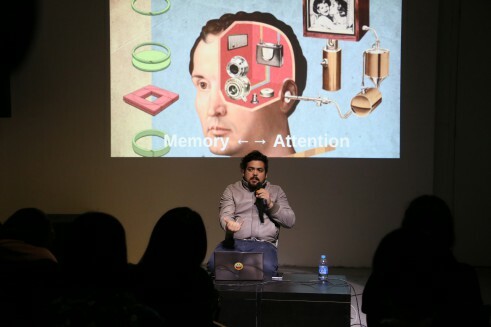 Fito Segrera: CAC stands for Chronus Art Center and it’s a non-profit new media art institution based in Shanghai’s M50. One of the founders, Dillion, runs four tech companies that provide the funding for CAC. 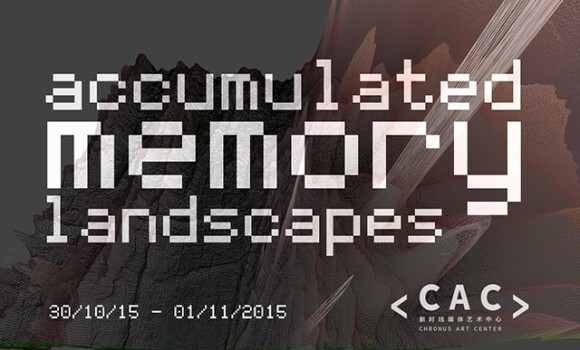 So CAC is kind of a platform for researching new media art and creative technologies that could expand the field. CR: How many people are on staff? FS: 12 people in total. CR: How did you first hear about CAC and get the fellowship? FS: Right after I graduated from the Parsons Design and Technology MFA program, I was working on another project at the New Museum’s NEW Inc when I ran into Zhang Ga, the artistic director at CAC and one of my professors. He said he wanted to set up a new team, and put together this research and creation program. At that point, I could either continue at the NEW Inc, which I wasn’t that happy with at the time, or apply to fellowships in New York. My practice is not commercial, it’s more research-driven and experimental. I really couldn’t see myself working at a commercial company, and those were the only kind of offers I was getting, basically start ups that needed someone with technical skills. My background is in fine arts. Zhang Ga said to me, “We will open a call for this fellowship but the first fellow will be curated, and you’re amongst our potential artists.” I got it eventually, I’d only been in China once before so it was all a little crazy. CR: Let’s back up for a second, what was your background before Parsons? FS: I studied Fine Arts, though actually that’s kind of a sloppy translation between Spanish and English. In Spanish we call it artes plasticas which is the idea that plastic can be shaped and molded as a way to reshape your thinking and artistic approach. Before that I did three years of robotic engineering but didn’t finish the degree because I wasn’t happy with that so I moved into the arts and started applying all this technology to my work. Then I got a Fullbright scholarship to go to New York and do my masters. CR: What was the funding situation like for the CAC fellowship when you started? FS: There was an open call when I started, and it was searching for one artist for one full year, for $30,000. 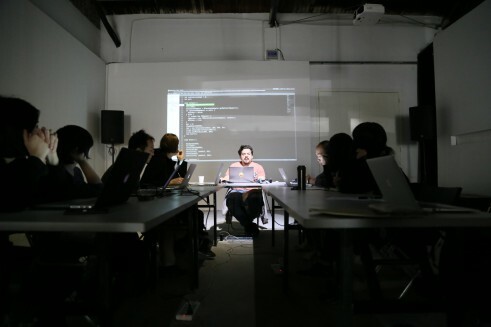 So it’s similar to the Eyebeam fellowship in terms of budget and time. Now I’m the director of the open call, I put together 5 research lines for possible exploration. I also put together the lab and got all the equipment. CR: So when you were a fellow, none of this was here. FS: Right, when I was here, there was nothing. One of the conditions of my arrangement with Zhang Ga was that I could come and do whatever I wanted during the fellowship but in the process, I would leave this space set up for future fellows. CR: That’s really interesting because one of the biggest problems that all the residencies have is staffing. Not that many people have that much arts administration experience. A lot of the successful residencies are run by artists who were once residents themselves; it’s a really great way to learn on the job. FS: Definitely. So now after a year I’m supporting two fellows a year at the Lab but there are also a few other residencies in the summer, called Summer Sessions. Now we’re also partnering with V2 (V2_Institute for the Unstable Media) in the Netherlands, and SymbioticA in Australia, and Rhizome in New York. CR: What did you work on while you were doing the fellowship? FS: As a fellow you’re responsible for producing your work and organizing public programming like workshops, talks that can take place at CAC space and at local universities, galleries, etc. We really encourage the artists to expand their project into something larger. When I arrived I was working on something I called Accumulated-Memory-Landscapes that was about the idea of capturing lost memory throughout the day. I was using wearable brain computer interfaces and measuring my attention levels constantly. So when your attention drops, the camera and microphone on the device captures whatever you’re experiencing and sends that to a server in real time. And then it produces a 3D landscape from brain data that contains the memories, rendered as abstract shapes. Anyone can essentially come into this space and explore the terrain of your hidden memories. It’s a memory prosthetic device that augments your experience. CR: That’s super cool. Tell us more about this open call, the areas of research you’ve set up, and what sort of projects you’re hoping to get. FS: CAC is working on its own research project and the current scope of this call is a combination of a few lines that supports our work: immersive environments, spatial position tracking systems, brain computer interfacing, AR and VR technology, and bio data representation and presentation. CR: Will the theme of the call change from year to year? FS: It’ll depend on the project we’re doing, the next two fellows we’re having this year will probably be working in these areas. CR: Would you consider letting a collective or a pair apply? Where the residents would offset each other’s skills? FS: Definitely. But there needs to be proof that the collective can produce the work. CR: What sort of equipment and tools does the Lab provide? FS: It’s kind of like a fablab: there’s a laser cutter, a band saw, large sanders, tools for cutting wood, drills, everything you would need to make physical objects. We also have a lot of electronics in the shop: microprocessors, sensors, resistors, transistors…our interns keep it very clean though! CR: Would another artist from another residency be able to come and use the lab equipment? FS: If they are artists working with our institutional partners then yes, definitely. Otherwise it’s just a matter of discussing the terms of collaboration but I should think so! CR: What other kinds of services does CAC provide for the fellows? FS: We try to give everything they would need to apply for a visa, though we can’t guarantee they get it at all. I got here on a 6 month single entry visa, which is pretty inconvenient for artists who have shows and need to travel. You need to ship all your work and the workflow really changes. We’ve made the fellowships shorter for this reason: two times a year for three months each. Aside from the visa, we also organize workshops for the artists and often either myself or Guo Cheng, our Executive Director, will lead them. CR: Can you tell us more about the workshops? Who was attending, what were their skill levels, and what do you think the impact was on the community? FS: One of the main objectives of the CAC Lab is to demonstrate what’s possible with using technology for art new media art. First, we create a program with a topic that’s derived from the theme of the exhibition. Then with that frame, we try to show people critical thought through the concepts and theoretical background rather than just teaching them the technique. For example, I taught workshops during Jim Campbell’s Accumulating Psycho exhibition, where he took the movie Psycho and blended each frame, frame by frame, and ran it through an algorithm that created an animated ghosted image. We took this idea of accumulating memory and memory archives that I was exploring in my work as well, and created a program of events around it. At the beginning I really wanted these workshops to be for artists, but I guess Chinese artists aren’t really into workshops, especially if they’re established. We’re really interested in education and reaching out, and so now we’ve opened it up to anyone who’s interested in thinking about technology in a different way. There are a certain number of slots and people can just sign up through WeChat. A lot of people come just because they feel it’s fun and cool but we want to stress that it’s there’s a critical discourse involved and that’s as important as learning the skills. Everyone is really technically smart here but thinking about a project from the concept first is a new thing for people here. CR: Are they usually free? FS: The first two were free but the previous one wasn’t because we had to buy some materials out of the budget. They’re under 100RMB though which is pretty affordable. CR: Your programming is bilingual. How do you deal with issues that come out of translating content that’s mainly culturally specific and heavy in theory? FS: We try the best we can with the lectures. Our translator researches topics she’s unfamiliar with before the event. The workshops though are a different story and because of the level of engagement in them, I always require at least a basic level of English proficiency. Here, the issue isn’t really the language...it’s more the cultural distance between the person teaching the workshop and the attendee that’s a product of the hierarchical relationship between teacher and student in the Chinese education system. This communication obstacle makes it hard for me to really talk with them, or help them because they’re often afraid of asking questions. CR: One of the residency’s artists we’ve worked, Joshua Hoare, with is a circus performer and theater director and when he lead improvisational workshops, he had such a hard time finding a way to get people to understand that improvisation isn’t really taught. He realized they were imitating his movements instead of creating their own. He reformatted the workshop several times to make sure the initial concept was understood, and that the “technique” is to not have a technique. FS: The first workshop I gave was related to the algorithms behind cellular automata but the whole concept behind it was the idea of physics and how the whole world can be an algorithm. The actual task was to explore cellular automata using Processing but in the end everyone was just interested in learning how to code with Processing rather than thinking about my original topic...if you mention any of these tools, like Arduino, you’ll get a lot of Makers. That’s totally cool but not really the objective of CAC, which is more critical. We try to make it clear in the call for the workshops that we’ll be exploring certain concepts plus teaching technical skills. CR: Do the fellows exhibit after the three months? FS: It really depends on the artist and the quality of their project. CAC has a really high standard for the exhibitions. 3 months is a really short amount of time especially for research and so we’re now looking for artists already engaged in a research process, and who want to use our facilities and resources as way to continue or finish their project. CR: So you’ve been able to get other shows in China because of the residency? FS: In a way, yeah. This group called CrossLab from Chengdu came to the gallery and saw my show and asked me to participate in a project to design new media art experiences for the interior and facade of a building. They’re quite a new group, but I was really impressed by their execution in putting the show together. I love the energy in China, the willingness to just do things and get things going. And of course there’s a lot of financial resources here. 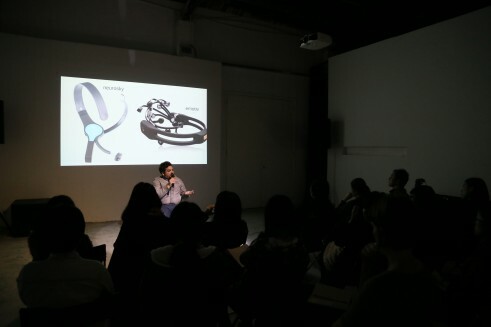 I’ve also shown a few times in Shanghai, actually just at the beginning of the year I did something in a huge warehouse in the West Bund that was about the “future of design and art”, there were around a hundred artists there from all over the world. This one was quite bureaucratic and felt less supported than the Chengdu show. I’ve shown a few times here at CAC as well, and abroad. I have an upcoming show in Guiyang in a real-estate development showroom...the building is in the shape of a diamond and 7 stories tall, and apparently they’re planning to physically move the entire building into another part of the city so it could be maintained as a museum! CR: Right, because just leaving it there would make no sense...last is a general question we ask when talking to a tech-focused organization, what are you doing to make sure the fellows aren’t all white men? FS: There’s an international advisory board and I invite them to jury with me. Last time we got about 70 applications, 10% of them were from local Chinese artists, and only two women applied. Not only was the percentage small, the artists themselves weren’t already engaged in new media art practice, and were painters or like flute players...So it’s been quite hard, and it’s something we’re trying to improve by doing the workshops. I see this even with our interns. When I interviewed them I asked them what they were studying, and they replied “new media art,” and I was kind of like “wow that’s so cool, it’s pretty rare to find undergraduates studying new media art!” But then I find out that even though the local universities offer a degree in it, their definition of new media art is pretty different than the one CAC or the art world has, and it’s more to do with communication or graphic design. But we’re starting to become more involved in exploring critical or conceptual new media art education models with Chinese universities, kind of like the School for Poetic Computation in New York. This interview was conducted by Fei Liu & Kira Simon-Kennedy on April 22nd 2016 in Shanghai for China Residencies.